Welcome to my fansite, a homàge to Basil Rathbone and Nigel Bruce's film and radio portrayal of Sherlock Holmes and Dr. Watson. 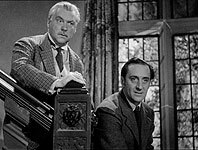 Speaking for myself, Rathbone and Bruce are the Holmes and Watson. Others have played the parts admirably and Bruce is often criticised for his bumbling Dr. Watson, but it's their off-screen friendship and the chemistry of Rathbone and Bruce that seeps through the celluloid and adds real flesh to the characters. Their partnership is one of the most recognisable double acts in cinema history. There are fourteen films in total; two are set in the late 19th century, and the other twelve updated to the 1940s, with four of those set during World War II. During a three year break between the films, Rathbone and Bruce continued in their roles as Holmes and Watson, starring in the Old-time Radio series “The New Adventures of Sherlock Holmes”. The Old-time Radio pages include 54 episodes available for download, advert-free versions available to buy on CD, as well as other information and trivia about this popular and very enjoyable series. to listen to audio clips. This an unabashed tribute so there's no critique, I'll leave that to others. I hope you enjoy looking at this website as much as I have enjoyed creating it.